I believe that learning is a continuous process and in order for you to hone your skills you should sharpen the axe of gift that you have. 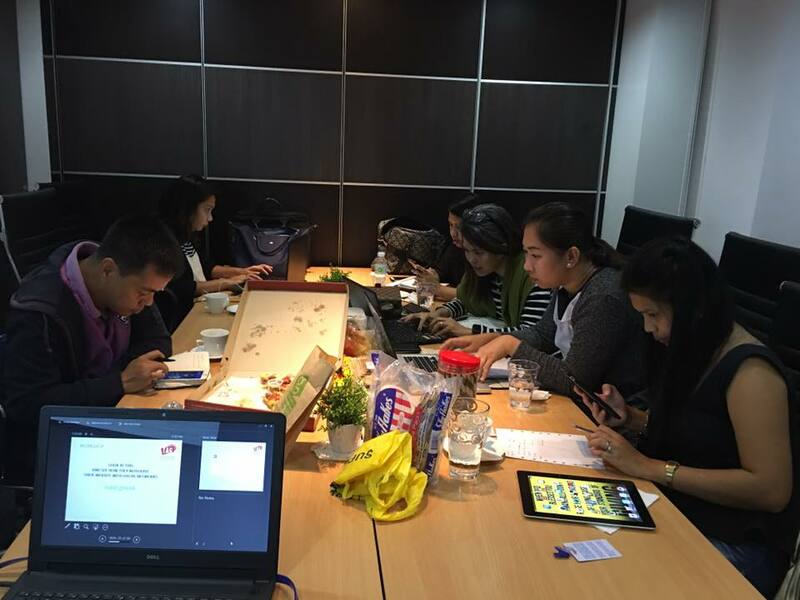 That is why when I heard about the Blogging 101 workshop of Engr. 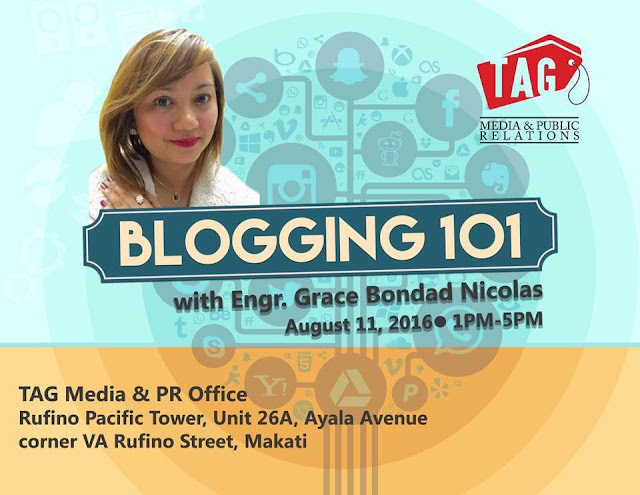 Grace Bondad Nicolas of Tag Media and Public Relations, I grabbed the opportunity to be part of it and today, August 11, 2016, Miss Grace Bondad Nicolas conducted a workshop that honed my writing and blogging skills. I arrived in VOffice, which is at 26A Rufino Pacific Tower, Ayala Avenue cor V.A Rufino, Makati City to attend Blogging 101. I am excited to learn new things and to answer the questions that I have since I started blogging like what are the important things that I should put on my articles, how to achieve your desired traffic and whatnot. I waited for a couple of minutes until I meet my classmates for the day. 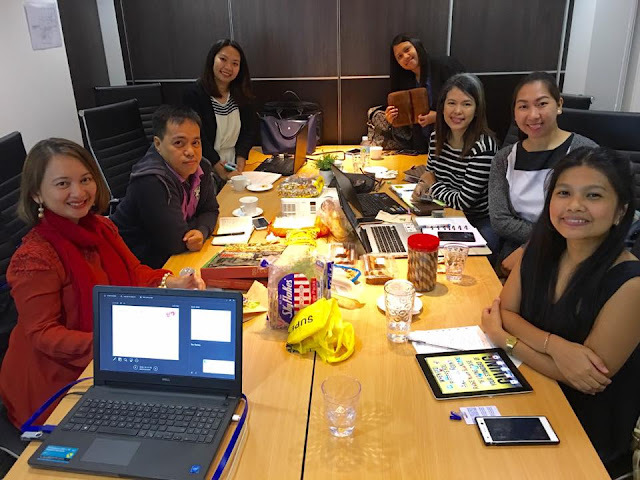 We are seven in the group and for some odd reasons I always meet people whom I share the same passion aside from blogging, this time planners! It’s been years that I am planning to be creative with my planner but don’t know how to start from it and now, lo and behold! I have classmates who are genious about it. 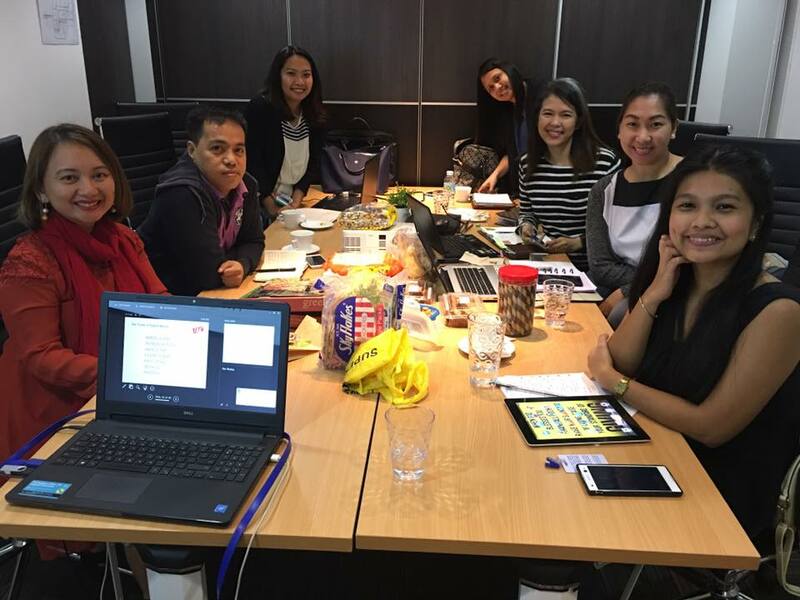 Before the workshop started, I learned a lot about planners from Marissa Falvo of pinayfitness.blogspot.com, Shine de Castro of choosetoshinenow.blogspot.com and JM Mansay of artandjournals.com. Aside from them my other classmates are Meg Villamarin-Mortega of nocturnalmomtalks.wordpress.com who is a mommy blogger and Macky Mcmazotes who is planning to start a blog soon. Miss Grace started the workshop by talking about statistics regarding social media and her slides made me think of thousands of possibilities and opportunities. Yes, social media is powerful now a days but I never imagined that companies are now hiring and paying jobs related to it. Aside from the power of social media. I learned about the Digital Marketing and in order for you to be successful with it, first, you have to own a website. Owning one gives you credibility and it is there to attract the strangers who will become your site’s visitor. The visitor will become your lead and will eventually become your brand ambassador who will promote your brand based on his testimonial. Second, you should be available on all sorts of social media be it Facebook, Twitter, Instagram, Youtube, Pinterest, name it! Social media won’t cost you anything. It is the best source of awareness and a lot of people are into it, which means great exposure. Lastly, advertise online. Advertising online would cost you a bit but the returns you will get will be double or even triple! She also talked about the importance of branding and being consistent on what you are doing because consistency is also one way attaining credibility. An important thing that she talked that a lot of bloggers forget once in awhile is Blogger’s Etiquette. I am new in this field and honestly I don’t have an idea on how to act or behave during events and if my colleagues are doing things right. This part of the workshop is what I needed the most. Content is the King- in order for you to gain traffic and credibility you should have good content intended for your readers or niche. Aside from that, keywords and followers are important so that your post will be first in line on search engines like google and yahoo. Integrity- If you enroll or sign for an event, make sure that you will be there. Be professional enough to inform the organizers if you can’t make it. Dress Up- You should dress up depending on the event that you will attend. You need to build your credibility not just to the organizers that invite you but also to the sponsors, visitors, speakers on the event and dressing properly will do it. As the saying goes "Dress to impress." Network… Network… Network- Whenever you go to an event, you should have two purpose. First, of course, is to cover the event and second, to meet the PR, who invite you, the Brand Manager or Product Manager and the other bloggers. Widen your horizon, meet new people, interact with them and learn from them. You will never know at first who will help you achieve your goal, so go out there and network, network, network. OBJECTIVE or ADVOCACY of the write up. After learning this we did some seat work and read each others article. The workshop indeed answered the questions that I have since I started blogging and I learned a lot from Miss Grace’s journey in blogging and life. This workshop will surely help not just bloggers who are just starting up but also bloggers who have been there but still have questions in getting traffic, how to position their blog’s branding, how is digital marketing helpful with their blogs and to be reminded of the etiquette and do’s and don’ts in the field.